My Mom, Philomena, paints all our bee keeping equipment. To say that my mom does a good job is a real understatement. She's over 80 years old but can outwork people of 1/4 her age. She's seen here in the backyard painting bee hives on the picnic table. My 85 year old dad sits to the left "supervising" her. Most of our bee keeping equipment comes from an outfit called Brushy Mountain. It's a family-owned business with wood working shops in North Carolina and Pennsylvania. I guess we're just keeping on with the "family" theme here because my mom has painted well over 100 hive bodies. She paints on primer and two coats of paint, sanding between coats for a perfect finish. The hives come out beautiful. It also ensures a very long life for every hive. When we assemble the hives we use coated nails and also glue both surfaces of each joint. This makes the hives super strong. We make sure every hive body is square using a tool called a speed square. 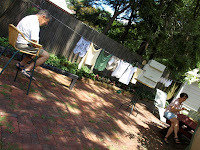 When we have time we coat the mating surfaces of the hive with bees wax so they don't stick together. The bees themselves finish the process coating the inner surfaces with a substance called propolis. It's made from the sap of the wounds of trees and plants. The trees secrete special substances to prevent from getting infected. It's been shown that hives with lots of propolis inside are healthier. The wood inside can have the look of a fine resin-coated antique. In all when we think about sustainability we often think about where materials came from and the like. But it's important to also think about how long something will last. We try and buy the best, longest lasting equipment we can. We build it the best way we can and try and treat it well thereafter. I am confident many of the hive bodies we have will last into the next decade and I have special reason to want them to. Quite apart from Yankee frugality, good business sense and sustainability my own mom helped me out by doing a wonderful job painting these hives. She's going great but at an age when her friends and family are starting to pass on, so it can be on my mind that she will too in a time not too far distant. I am glad to have something that I can work work with that she's had her hand on. I'll think of her and my dad sitting in the back yard and all her crazy shims and methods for getting the paint just right.